Please join us for the Panel Discussion and Reception for the show. This will take place on Thursday, July 29th. The discussion will begin at 7:00pm with the reception to follow at 8:30pm. The eye of an artist has a keen lens on the health and role of the economy. How well the money is flowing affects how they and all of us alike live, work, and plan for the future.” The Salmagundi Club is honored to present “HARD TIMES – An Artist’s View,” which since its conception earlier this year has uncovered a simmering pot of the results of economic dislocation illuminated best, and only, through an artist’s brush. 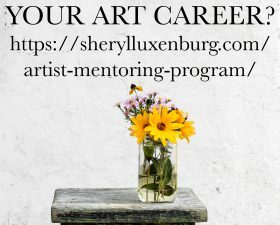 The concept: Ask artists to paint instant history, to reach into their souls and put onto canvas their expression of the toughest economic times since the Great Depression. The result: A compilation of over 30 stunningly realistic pieces, many of which were painted specifically for this show, from a broad range of artists both near and far. Their commonality: A refreshingly intense desire to express their concerns, opinions, and view of what it means to be living in . . . HARD TIMES. HARD TIMES opened on November 21, 2009 at the Thomas Kearns McCarthey Gallery in Park City, Utah. 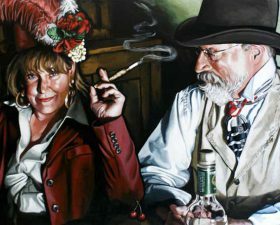 After concluding its run in Park City on December 15, 2009, the exhibition traveled to The Springville Museum of Artand will remain there until July when it will move to New York City to be on exhibit at the Salmagundi Club. Participating artists will include Steven Assael , Garin Baker, Warren Chang, Harvey Dinnerstein, Marvin Franklin, Tim Gaydos, Max Ginsburg, James Harrington, Jeffrey Hein, David Jon Kassan, Mary Beth Mckenzie, Denis Peterson, Mario Robinson, Robert Semans, Burton Silverman, and Costa Vavagiakis . The show is curated by Traci M. Fieldsted. 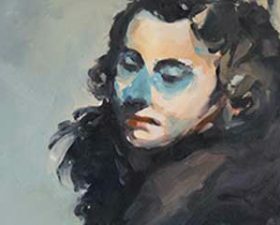 The Salmagundi Club, located at 47 Fifth avenue in Manhattan, is proud to present the “Hard Times – An Artist’s View” exhibtion. In conjunction with this historical exhibit, the Club will host a number of unique educational opportunities and events. Fred Ross, founder of the Art Renewal Center <http://www.artrenewal.org/> . ARC is a visual arts organization which advocates the rejection of Modernism and the current art establishment, in favor of what it defines as the previously established “standards of craftsmanship and excellence”. Vern G. Swanson Ph.D, Museum director and host of the “Hard Times” Exhibition at the Springville Museum of Art. He is a noted author, lecturer, and art historian. Peter Trippi, Editor of Fine Art Connoisseur <http://www.fineartconnoisseur.com/> and former director of the Dahesh Museum. Harvey Dinnerstein <http://www.freynorris.com/artwork_list.php?id=3> , award winning figurative artist, author, and noted educator at the Art Students League. Burton Silverman <http://www.burtonsilverman.com/> , world-renowned, illustrator, painter, author, and teacher. Portrait Workshop in Oil Paint by Max Ginsburg, Saturday, July 31st, and Sunday, August 1st, from 9am-4pm. 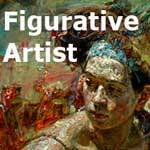 $400, $375 for Salmagundi members. Max Ginsburg <http://www.maxginsburg.com/> is a noted realist illustrator and painter. Portrait Demonstration in Oil Paint by Garin Baker, Wednesday, August 4th, at 7:00 pm. Garin Baker <http://garinbakerart.com/> is a lauded painter and muralist. 5-day Portrait Workshop by Mario Andres Robinson, Monday, August 9th, through Friday, August 13th, from 9:30am-4:30pm. 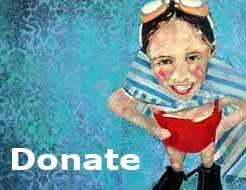 $400, $375 for Salmagundi members. 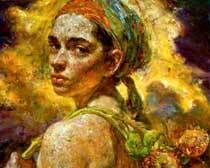 Mario Andres Robinson <http://marioarobinson.com/> is a noted portrait painter in watercolor and pastel. Portrait Demonstration by David Kassan, Saturday, August 14th, at 1:00pm David Kassan <http://www.davidkassan.com/> is a well respected realist painter and award-winning member of the Salmagundi Club. David will conduct his demonstration either in oil or as a drawing. 2-Evening Oil Painting Portrait Demonstration by Steven Assael, Tuesday, August 17th, and Wednesday, August 18th, at 7:00 pm. Steven Assael <http://stevenassael.com/> is a painter and educator, and he is recognized as one of the leading representational figurative artists of his generation. The Salmagundi Club, a 501(c)3 non-profit arts organization, is dedicated primarily to the exhibition of fine art created by living American artists and to nurturing a friendly atmosphere conducive to learning about art with classes in drawing and painting, discussions about art materials and techniques, and a host of social activities. All exhibitions and most events are open to the public.